Snyder to deliver his final State of the State address. What will he say? Governor Rick Snyder brings his sound fiscal-management-show to the stage one last time tomorrow at the Capitol. But, he’s delivering his final State of the State address to an audience of lawmakers who just dealt him a rare veto override. Snyder could be celebrating eight years of Republican control in Lansing while he’s been in office. Except Snyder has often found himself on the other side of the Republican majorities in the House and Senate. Last week, his fellow Republicans - along with Democrats - overrode his veto. This is the first time that’s happened in 16 years in Michigan. It’s only the fourth time it’s happened since the 1960’s. At the same time, Snyder is bargaining with GOP leaders on the size and scope of other tax breaks to address a glitch created by the new federal tax law. Snyder has cut taxes as governor. But he’s also insisted that tax cuts shouldn’t make huge holes in the state budget. Snyder has made structurally balanced budgets that are less susceptible to the vicissitudes of Michigan’s boom-or-best economy a hallmark of his administration. His Republican legislative partners? Not so much. Along with the veto override, legislative Republicans are pushing for a bigger personal exemption and other added tax breaks that Snyder World fears would imperil stable budgets going out years into the future. The veto override was a message from GOP leaders to Snyder. And that is, your devotion to structurally balanced budgets won’t stand in the way of our political goals. Snyder, for example, would like to bump the state’s “rainy day” savings above a billion dollars for the first time since the Great Recession. That makes Wall Street and a budget-balancing governor happy. But putting money into savings doesn’t typically win points with voters. And it doesn’t square with the belief among many Republicans that government shouldn’t be sitting on large reserves of cash that could be returned to taxpayers. Snyder wants a long-term stable budget to be part of his legacy. He will no doubt use his time on the rostrum tomorrow evening to make the case to the Legislature and the public for his version of responsible fiscal planning. It can be tough being a lame duck governor. Tomorrow is Rick Snyder’s last best chance to make his case in his most public forum of the year. Helping your adversary to help yourself. It’s a political tactic and we’re seeing it right now in Michigan’s Republican primary for governor. Lt. Governor Brian Calley is running for governor. But, it looks like he’s polling behind fellow Republican Attorney General Bill Schuette. Schuette has been touting his conservative credentials including an endorsement from President Donald Trump. 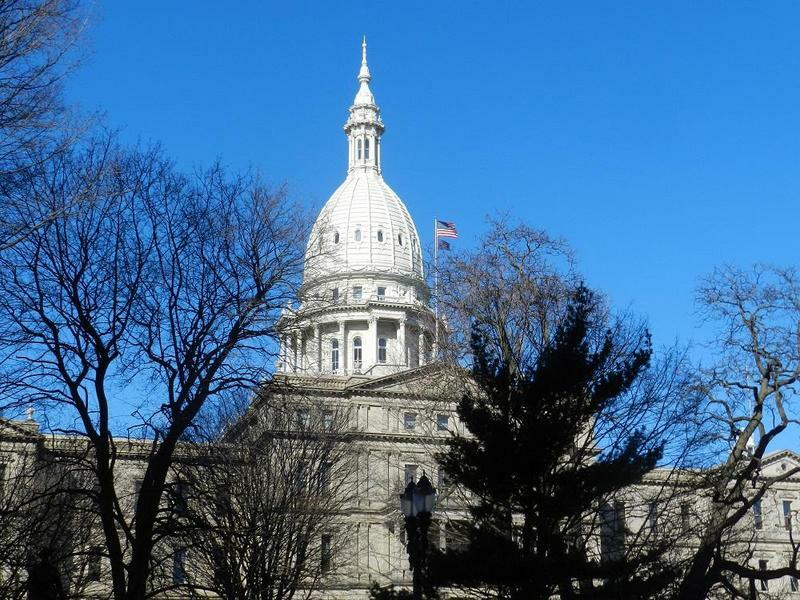 We could see the most dramatic change to Michigan politics since term limits. This afternoon, an all-volunteer group is one step closer to overhauling how redistricting is done in Michigan. As voters pass judgment in the first mid-terms of the Trump era, many are wondering if Michigan will be a congressional battleground in 2018. There’s a lot of talk about the possibility of a wave-election come November as Democrats prepare for their “wait-til-next-time” moment after the Trump upset of 2016 when Michigan played a central role. And after last fall’s gubernatorial wins in New Jersey and Virginia and the Roy Moore drama in the Alabama Senate race, 2018 is shaping up to be a doozy of an election year. 2017 was certainly an eventful year in politics, and 2018 promises to be more of the same. We have a race for governor and every statewide office in Michigan up for grabs, open Congressional seats across metro Detroit, key ballot issues, and national mid-term elections to look forward to.